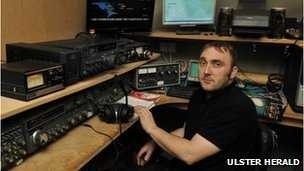 A radio enthusiast from Castlederg in County Tyrone has been praised for saving the lives hundreds of airline passengers, from his shed. Benny Young was turning the dial on his radio when he picked up a Mayday call from a United Airlines flight from Dublin to Boston. Mr Young said he heard the mayday call just before moved to another frequency. He then relayed information between the pilot and ground control at the airport. “I heard two people talking about Hurricane Sandy and that’s what made me stay on the Pacific frequency and I heard the mayday call,” Mr Young said. “I ended up talking to the pilot for about 17 minutes and I got the man operating the emergency net to come up to my frequency. “He could hear me, but he couldn’t hear the pilot because of a problem with the transponders on the ground which had been taken out by the storm. Mr Young also helped another plane over the United States on the same night. “The other plane automatically scanned the frequencies and must have found us. “I didn’t have the time to strike up a conversation this time. “There was great excitement at the time, it was great. ← Where are some places people are using this program?